I've done a couple reviews of papercrafting books and I am very excited to review this one. Papercrafting continues to grow in popularity and new ways to use this craft are expanding. One of those ways is party planning. The author of this book, Valerie McKeehan, has made party planning very easy and fast with Life of the Party Papercrafting. McKeehan is the founder of Lily & Val, the gifts brand that offers endearing prints, darling greeting cards and other goods that are decorated with gorgeous script and McKeehan's signature chalk-style lettering. She's created this new book, which includes cards. tages, coasters, menus, wine tags and more, all with her classic and sophisticated handwriting and illustrations imbued. The book includes everything you need to makes ready-to-use paper goods to throw a successful bash, from informal to elegant. Just punch out along the perforations to use each item as-is, or add your own personal touch by embellishing with scrapbook paper designs. This book includes three party themes, so you can set the tone for a more memorable event or mix and match to create a unique look. These paper crafts are perfect for brunch parties, bridal showers, book club gatherings, dinner parties, tea parties, garden parties and more. Plus, the book is a wonderful value; buying it saves on all the separate materials you would have to purchase separately. The entire party is right in the book! McKeehan has been crafting hand lettered art and paper goods with Lily & Val since its creation in 2012. McKeehan has a quaint aesthetic, with each item personally hand-lettered and illustrated. She is inspired by memories of days well-spent and the beauty of ordinary life, she says, she likes to draw from nostalgia, whether its a conversation over a cup of tea at Grandma's table, a warm cake fresh from the oven, or a walk through her home city of Pittsburgh. She likes to tune into the simple pleasures of life and live creatively and passionately. What makes this book so much fun is the desire to embellish her papercrafts. They come looking beautiful already. And your desire is to dress them up for a party or luncheon that would do them justice. I love all of the designs, from the menus to the wine tags and the invitations that you can address. Everything in this book is easily ready to be individualized by you or you could have a papercrafting party where you do this with your friends. Either way, it will look amazing because you have a beautiful canvas to start out with. As you can see, these are all quite beautiful and charming. I would highly recommend them for your next brunch, luncheon, dinner party or garden party. Some of these items can be colored if need be. Some of them are already colored and look beautiful already, just add your script. I think you will find this is a fun papercrafting book to have. If nothing if will get you out of a rut of doing the same old thing and get you on a new path. And there is nothing wrong with that. Sometimes we need to be shook up. I do think you will love this book with its beautiful illustrations in it. 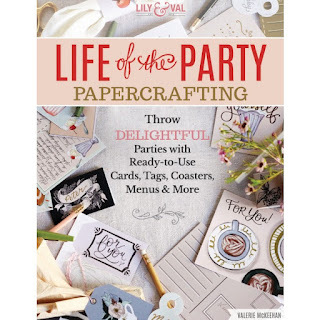 Life of the Party Papercrafting is available from www.foxchapelpublishing.com, www.barnesandnoble.com and www.amazon.com. It is 112 pages long and comes with an assortment of scrapbooking paper, cards, tags, wine tags, coasters, menus and more.